Happy Christmas Eve! Tonight Santa comes so I hope all has been good this year. 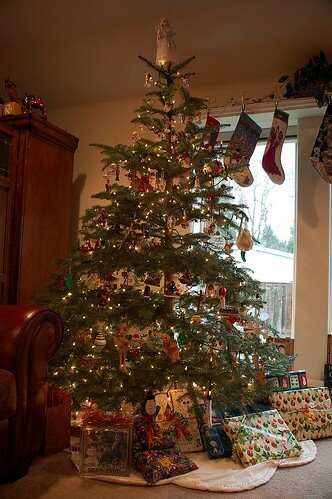 The stocking are up, the presents are sitting nicely underneath the tree. Now for the celebration to begin. The day was manly spent preparing for Christmas Eve dinner, but for a bit, some of my time was spent working on my cross-stitch and admiring our Christmas tree. I love the holiday season. Also please pay careful attention to my family's "fireplace." Isn't it great! It has all the sound effects and makes you feel like there is actually a fire. Um.... minus the heat part though. I think it's still pretty clever. The Grandparents came over for a delicious cooked dinner of roast, carrots and potatoes. The china was set out nicely on the table. The meal was wonderful and so was the holiday spirit. Presents were also opened as well. Great quality family time.